This article shows how to make a Windows 7 gadget that extends its U/I with a flyout panel -- a window that pops out next to the gadget. The example gadget shows several additional techniques: How to automatically resize a gadget or flyout panel to fit its contents, how to use an ActiveX object in a gadget, and how to use the System.Shell.chooseFile method. In a previous article, Create a Win7 Gadget, we covered the basics of creating a Windows 7/Vista gadget -- a small application program with an HTML U/I that you can drag from the Win7 Gadget Gallery and drop onto your desktop. Please read that article, and those listed in the References section below, for background information. The HTML for the flyout panel is nothing special... any collection of input items and display areas. You will need to provide the script code to support the functionality you want, and you'll most often want to provide an onload handler to run code that should be executed when the flyout opens. It does not require focus or user interaction; for instance, if you create a gadget to remind yourself about the afternoon staff meeting, it could be opened by a window timer. In that case, I suggest that you use a full-screen layout with big red letters. The handy System.Sound.playSound() method could be used to crank up some John Phillips Sousa selections, if that's what it takes to wake you up. ... but only after the magic sequence in line 8. The issue is that HTML elements don't always know their own size, and the offsetHeight property, for instance, is often 0. But once the element has been rendered, you can read the values and then apply them to the whole window (in this case, document.body). By using window.setTimeout() as in line 1 above, I give the document a chance to "pre-render" the content, and that lets me get useful measurements a millisecond later. As before, I have put most of the script code in a separate .JS file. If you use the Trial-And-Error Design Pattern, like I do, this makes your task much easier. The Visual Studio Just-in-Time debugger works best when the script code is in a separate file. I recently worked on a question here at EE where the asker wanted to know how to get a list of all shell "action verbs" that can be applied to to a particular file. The System.Shell object that is provided by the gadget runtime environment exposes a lot of functionality, but that's an example of something it can't do. However, the COM interface exposed by the shell itself does provide a Verbs() function. So I decided to use that as an example of using an ActiveX module in a gadget. sHtml += "<td><input type=button value='DoIt'"
The above code creates an ActiveX object, the Windows Shell object (line 11), which provides the methods I want to excercise. The code obtains a Folder object and a FolderItem object and cycles through the Verbs collection to list them all. The script generates the HTML to define a table (lines 22-34), including a command button to execute the verb. It then populates the <div> from the flyout document with (line 35). Because the table will vary in length, we again use the "size-to-content" technique to give the flyout panel a dynamic height. The flyout panel closes automatically the moment it loses focus. You can click on the desktop to make it go away. It can also be closed programmatically, and in the example, I added a "Close" button to show the technique. In this article, we created self-sizing gadget with a self-sizing flyout panel. 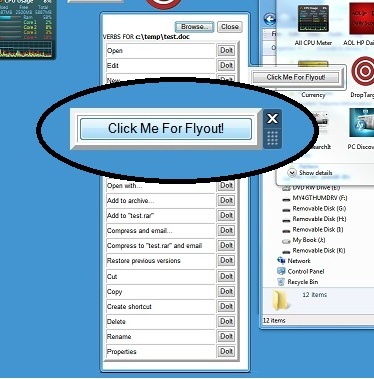 Creating the Flyout involves using the System.Gadget.Flyout object to identify an HTML file and set a mechanism to trigger the display when wanted. We also looked at how to use both System.Shell (provided by the gadet infrastructure) and the richer Windows Shell COM object to do some exploring of the potential applications for these nifty gadgets.